Batteries on e-bikes can be set on different power levels to assist the rider. Based on a survey of nearly 1,000 area trail users, the Pitkin County Open Space and Trails director will recommend lifting the ban on some e-bikes to allow them on paved trails, including the popular Rio Grande Trail. Nearly 70 percent of people who responded to a recent survey supported having e-bicycles on paved trails that offer electric-motor assistance when riders pedal, according to information released Monday. Support dropped to below 50 percent for e-bikes that feature the motor assistance whether the rider pedals or not, according to the results released by the Open Space and Trails program. “We are recommending that (pedal assist-only) bikes be allowed based on significant public support,” Open Space and Trails Director Gary Tennenbaum said Monday. 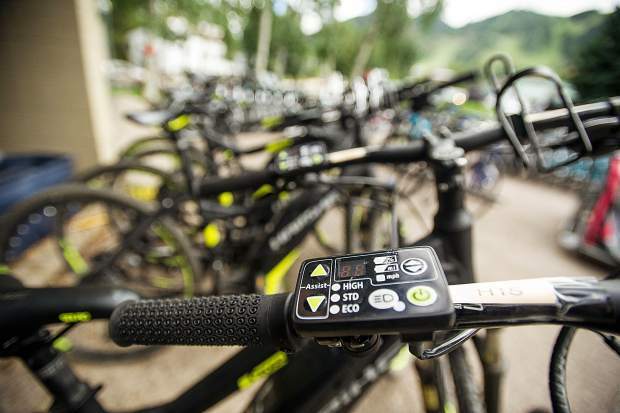 The Pitkin County board of commissioners passed a moratorium in August banning e-bikes until May 1 in response to a state law at that time that went into effect allowing the bikes on all trails accessible to bicycles and pedestrians. The board wanted to give the public time to chime in on the subject before making a final decision on what to do about the increasingly popular bikes. A local communications firm gathered comment online, on the phone and at various public gatherings between March 19 and April 20, according to a memo included in the materials for Thursday’s Open Space and Trails Board meeting. The open space program currently bans e-bikes on all trails it controls in Pitkin County, including the Rio Grande Trail. In addition, e-bikes are prohibited on all soft surface and single-track trails owned by the open space program. Snowmass Village also passed an e-bike moratorium in July. State law breaks down e-bikes into three categories: those with a standard assist that works only when riders pedal; those with a throttle that assists whether the rider pedals or not; and those that can go up to 28 mph. The first two types — known as class 1 and class 2 e-bikes — cannot go more than 20 mph. In total, 952 people answered the 13-question survey, nearly 54 percent of whom were 51 years old or older, according to the memo. Of the responses 340 were from people in the Upper Roaring Fork Valley, and 525 residents in the midvalley and downvalley areas also responded, the memo states. Tennenbaum said that’s a large amount of responses, which surprised him and shows the issue is popular with valley residents. The survey only asked people about the class 1 and class 2 e-bikes, which are the only types specifically allowed under state law, Tennenbaum said. The class 3 speedsters can be allowed if local jurisdictions approve them, he said. Of the 944 people who responded to the question about allowing class 1 e-bikes on paved trails in Pitkin County, 487 or 51.6 percent said they “strongly” supported it. Another 161 people or 17 percent supported the action, meaning that 68.6 percent of respondents supported class 1 e-bikes, according to the memo. The survey found that 24.3 percent of people strongly opposed or opposed allowing the bikes on county paved trails. For the class 2 option, 947 people responded, with 336 or 35.5 percent strongly supporting those types of e-bikes and 132 people or 13.9 percent supporting them, the memo states. That brought total support to 49.4 percent. A total of 40.4 percent of respondents either strongly opposed or opposed class 2 bikes on paved trails, the memo states. “I don’t feel (class 2 e-bikes) received significant support,” Tennenbaum said. About two-thirds of those responding also submitted comments about e-bikes. Most of the people opposing e-bikes had safety, crowding and speed concerns. “I was run over last year on the (Rio Grande Trail) and had a concussion and skull fracture,” one person wrote. “I spent eight days in the hospital. All I did was walk on the trail. However, many people wrote in praise of e-bikes, especially older people. “As an avid, aging bike rider, an e-bike will extend my ability to continue riding as I get older,” another person wrote. Commuters liked e-bikes, as well. Tennenbaum said he thinks having a summer or two with class 1 E-bikes will provide answers about safety and how the bikes interact with other trail users. “We’ll see how safe it is and how people react,” he said. The county’s E-bike ban officially ends today, though the Open Space and Trails regulations banning them remain in effect, Tennenbaum said. However, the Open Space and Trails Board is set to debate the issue Thursday and will likely make a recommendation to county commissioners, he said. Tennenbaum said he will likely present that recommendation to the county board during a work session May 8. If the board signals support for the recommendation, commissioners will begin the process of changing the open space regulations the next day at its regular meeting, he said.